‘Survive Style 5+’ takes five seeming disconnected stories and slowly winds them together; Ishigaki (Tadanobu Asano) is man who finds himself repeatedly killing and burying his wife only to have her reappear at the house and try and return the favor. Yoko, (Kyoko Koizumi) is an ad executive who accidentally loses her tape recorder filled with ludicrous ideas for commercials. Kobayashi (Ittoku Kishibe) is a father who is hypnotized into thinking he’s a bird for a television show, but is unable to be taken out of his state when the hypnotist is killed on stage. The killer (Vinnie Jones) is a hit man who has a habit of asking people (and occasionally broccoli) about their function in life. There is also a trio of young burglars including Morishita (Yoshiyuki Morishita) who’s trying to come to grips with his love for another man. 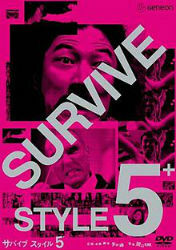 ‘Survive Style 5+’ is an amazing black comedy. There’s so much going on within the intertwining stories, it’s not possible to really discuss it in a capsule review like this, so it’s a film I’ll definitely be revisiting with a more lengthy take in the future. It gets an inclusion in 12 Days of Weirdness because the events transpire around the Holidays. Most notably in Asano’s story, which features one of the most startlingly colorful and strange Christmas scenes ever filmed: Ishigaki returns home after yet another attempt to bury his wife only to find his house over decorated with lights, a tree, a taxidermied reindeer in the bedroom and a giant menacing stocking hanging from the ceiling. In some ways it’s the perfect encapsulation of the film in that it starts somewhere dark, turns comedic, then a little unnerving and finally heartbreaking. A brilliant film.